Climate change has been recognized by the majority of the world as an urgent issue with truly global consequences. 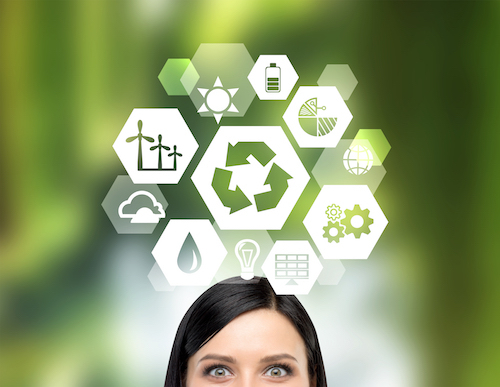 Increasingly, women in renewable energy are being recognized as effective thought leaders capable of advancing the renewable energy sector and advancing our climate goals. The renewable energy sector is, in many regards, non-traditional especially compared to other energy sectors such as oil and gas or coal. These industries have been and continue to be largely populated by a male workforce. In contrast, according to a study by the International Renewable Energy Association, in some areas of the world female workers make up as much as 33 percent of the renewable workforce. This increased representation helps to counter the stigma that women around the globe still experience when breaking into energy and technology roles, but increasing female representation continues to be a major goal to achieve equity as we move toward a clean energy revolution. Around the world, there are a range of initiatives that are working to ensure women are more visible in the global renewable energy sector. Many of these initiatives focus on addressing a core issue observed not only in energy, but also the broader STEM fields. Studies have shown that many women are reluctant to enter STEM careers or remain in the energy sector because they lack role models. The Clean Energy Education and Empowerment Program, or C3E, aims to address this problem. C3E was created as part of the Clean Energy Ministerial, a forum that aims to connect leading clean energy investors from both the private and public sectors in an effort to accelerate the global transition to clean energy. As of this article, 10 CEM governments have committed to a total of 59 C3E programs with the goal of advancing women’s participation in the clean energy revolution. In addition to providing mentoring to women in the energy sector, these C3E programs aim to support both industry and government to deliver on the goal of improving gender diversity in the energy sector. The Middle East Solar Industry Association (MESIA) is one of the region’s leading organizations in solar technology and it believes women have an important role to play as the technology evolves. That is why MESIA has brought Women in Solar (WIS) to the region. WIS is a group organized by women, for women that hope to provide females working in the solar industry with a strong voice. Following the ideals laid out by the C3E programs, WIS holds events, business breakfasts, and briefings to provide women across the region strong networking opportunities and access to skilled mentors. WIS hopes to create a space where all women who have an interest in the solar industry and renewable energy sector can come to be inspired as well as inspire future generations of women. Programs like WIS seem to be working as female representation in the region’s solar industry is quite impressive. While the region is still working towards equal representation, women are increasingly finding themselves in leadership roles in the sector. Do you know any female leaders in the solar or renewable energy sector? Let us know about them in the comments below. And if you haven’t already, be sure to check out our Facebook, Twitter and LinkedIn for the latest powergreen news.